The trial of Abiodun Agbele, an aide to a former governor of Ekiti State, Ayodele Fayose, continued on March 28, 2019, with a prosecution witness narrating how he coordinated the movement of the N1.2bn slush fund, in the build-up to the Ekiti governorship election in 2014. Agbele is standing trial before Justice Nnamdi Dimg alt='How Fayose's aide, Abiodun Agbele coordinated the evacuation of N1.2bn cash - Witness tells court' of a Federal High Court, Abuja, along with three companies – Sylvan Mcnamara Limited linked to a former Minister of State for Defence, Musiliu Obanikoro; De Privateer Limited run by him, and Spotless Investment Limited whose bank account was allegedly being operated by Fayose and his wife, Feyisetan. Testifying as the third prosecution witness, Biodun Oshode, Zonal Head of Zenith Bank Plc, South-West, while being led in evidence by counsel for the EFCC, Wahab Shittu, further narrated the role he played towards the movement of the cash on May 17, 2014. He said: "It was Biodun Agbele that coordinated the movement, he came with security and we went to the airport. He further told the court that the slush fund was handed over to Agbele, adding that he also “supplied the accounts in which the money was disbursed into”. He gave the accounts to include, De Privateer Ltd, Spotless Ltd and Ayo Fayose's account. 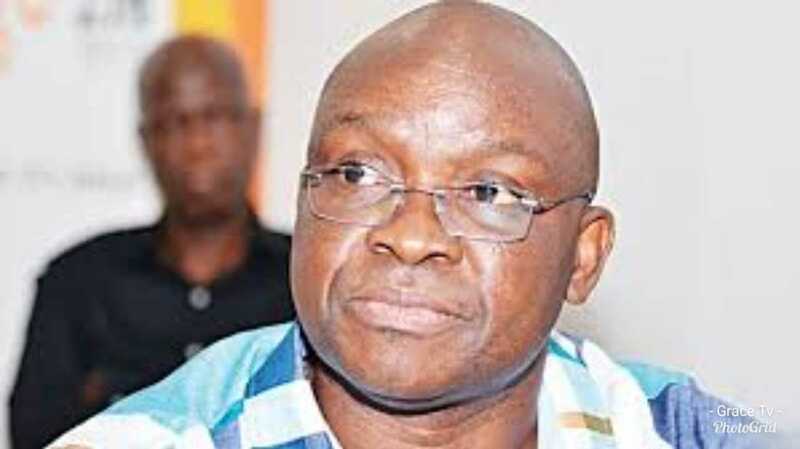 He revealed that De Privateer account received N219,400,000; Spotless Ltd received N100,000,000 and Ayo Fayose's personal account was credited with N137,000,000, while balance of N200,000,000 was taken to Ado-Ekiti, Ekiti State. The prosecution, thereafter, tendered the statement of the witness volunteered to the EFCC during investigation, and it was admitted in evidence. Another statement made to the EFCC on July 25, 2016 was also admitted in evidence, including a covering letter from Zenith Bank Plc with bank statements of De Privateer Ltd admitted, and covering letter from Zenith Bank Plc to the EFCC with bank statements of De Privateer Ltd.
No objection was raised by the defence team. Under cross-examination by counsel for the first defendant, Mike Ozekhome, SAN, the witness however, denied receiving any instruction from Agbele concerning evacuation of the cash. “The instruction was from his colleague, Lawrence Akande,” he said. Ozekhome, further asked him if the procedure for the transaction was legal, and he said, “Yes”. He further stated that the slush fund was flown-in, in a single plane, and no action was taken against him concerning the transaction. When asked if he knew Obanikoro or had any dealings with him, he stated that he had never met nor had any dealings with Obanikoro other than being the Minister of the Federal Republic. During his cross-examination by the counsel for the second defendant, Olalekan Ojo, SAN, he noted that someone who is not a signatory to an account cannot withdraw money from it, adding that he did not know the office where the lodgement took place. The fourth prosecution witness, Fajuyitan Olaitan, who was Head Treasury at the Head Office of Diamond Bank, Lagos, while being led in evidence by Shittu, told the court that he received an instruction to process “a high valued transaction”, which could only be made at the Head Office of the bank through the department he was heading. Under cross-examination by Ojo, the witness claimed that he did not know the person that issued a payment instruction regarding the debit transaction as his duty only bordered around processing of the debit. The matter has been adjourned to May 24 and 27, 2019 for “continuation of cross-examination”.